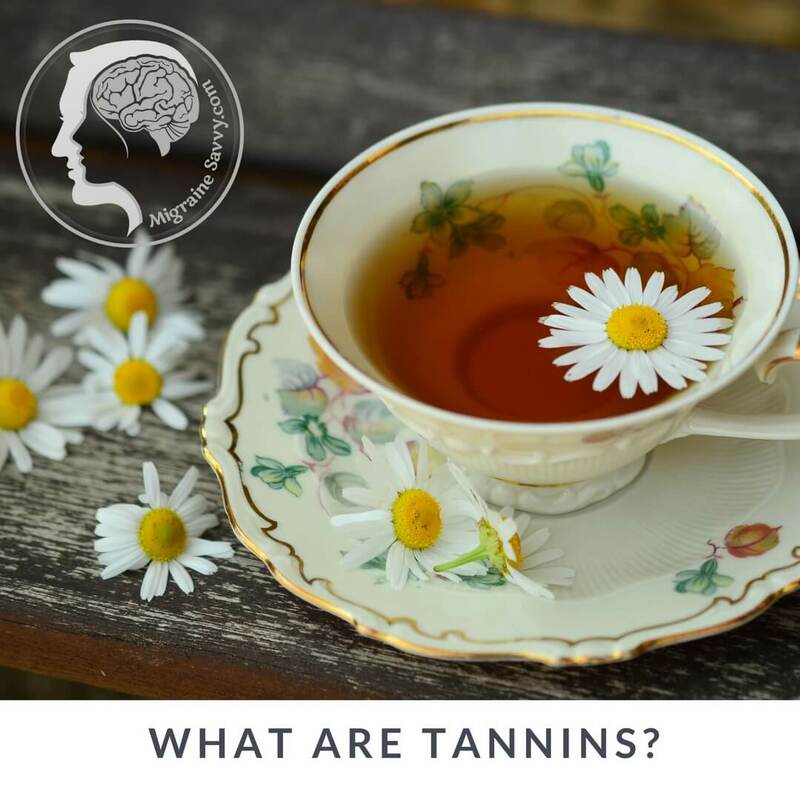 Why are tannins considered a migraine food trigger? Black tea, beer, dried fruit and wines all have tannins in them. What are tannins and why the connection to migraines? "Any phenolic compound of sufficiently high molecular weight containing sufficient hydroxyls and other suitable groups (i.e. carboxyls) to form effectively strong complexes with protein and other macromolecules" studied in a particular environment. Ok! So - in English please? Tannins are plant compounds that interfere with protein absorption in the body. Black tea, beer, dried fruits and many wines have tannins in them. Adding cream or milk to tea stops not only the bitter taste, but inhibits that protein interference in the body. This does not mean it stops being a migraine food trigger. Why exactly do tannins cause Migraines? Cornell University says it much better than I can here – have a look at their website if you would like a very thorough scientific explanation. The list is long ... so here are just a few of the more nasty ones that score high in tannins. This gave me a much clearer picture of why tannins are a migraine food trigger. Sadly she lists some of my favorite spices: Cinnamon, Tarragon, Thyme, Turmeric, and Vanilla. According to e-how.com there are “at least 44 herbs that contain tannins”: Chamomile, Echinacea, Eucalyptus, Peppermint, FLAX seeds (boohoo) and Slippery Elm which aids and can repair the digestive tract. Alarmingly they also list the “malted barley flour” found in most commercially made breads and bread products like crackers and pizza bases. Click here to see a more extensive list of foods that trigger migraines. The category that never ceases to amaze me is the chemicals in food and other products area when it comes to unrecognized (unadvertised) migraine triggers. On Janette Navia’s site she also mentions “other products with phenolic additives” like: food dyes in yellow cheese and margarine's, vitamin pills and most herbal products! Some margarine is green or black before they dye it yellow. And surprise surprise - petroleum based cleaning products, perfumes, paint fumes, and some fragrances in soaps and shampoos. Perhaps that explains the high incidence of migraines with perfume as a trigger. Yeah! It's not just my imagination. Sorry, I digressed, back to tannins. Check out this video from Jane Nickles, the author of "Wine Speak 101" on Tannins and Wine Pairing and the natural tannin rule. For a migraineur I believe it to be a sure fire way to bring on a migraine! Just in case you don’t know this already! She says that if you eat pecans or walnuts, which are also high in tannins, with your main meal - chicken, red meat, or even on bread - that will remove the tannin in the red wine. Now is that just the taste or will it work for us too? Sounds the wrong way around...tannin and more tannin! And this video "What are Tannins" by Daniel Delaney - it is just too much fun! I know ... we don't get to drink red wine. Well some of us don't. He says that Pinot Noir and Sangiovese grapes are the lowest in Tannins. If that helps at all! I say avoid your food triggers at all costs. But if you don't know them yet doing an elimination diet is a good place to start. And the other thing that got mentioned again and again in the Migraine World Summit was making different lifestyle choices and being proactive. Studies say that biofeedback is one of the most effective ways for us migraineurs to be proactive and avoid the next attack. Prevention, prevention, prevention! Do Tannins Trigger You Too? Tell us about your own triggers and if tannins are a migraine food trigger for you. Tell me in Facebook.